thoughts on planning a horse barn Archives - Blackburn Architects, P.C. : Blackburn Architects, P.C. A client recently asked one of our architects for recommendations on adding heaters in the barn. 1) Forced hot air rises and heat stays at the ceiling level, adding unnecessarily to the cost of operating the barn. Blackburn barns are designed to allow air to escape thru the roof vents, so at a minimum sending heat skywards doesn’t make financial sense. 2) Forced air systems move airborne particles around the space and, given the size of the barn and the heat loss expected thru the roof vents, heaters must pump a lot of air at a high velocity to provide sufficient heat to keep the barn to a temperature that might be considered sufficient (which varies with personal preference). 3) Forced air heaters are unhealthy for horses because they spread dust, mold and disease throughout the stable area. Horses give off a tremendous amount of moisture, especially in winter, and that moisture contains bacteria and other viral matter that can be harmful to their sensitive respiratory systems and spread to other horses. If a barn is closed up too tightly (the barn needs to breathe in all temperatures) the barn can become too warm and increase the opportunity to breed bacteria that would normally be ventilated out of the barn. There may be some exceptions for older and ailing horses but a tightly-closed, heated barn is often more harmful than helpful. We recommend discussing with your vet exceptional conditions that may be needed for young, aging or infirm horses. Strategically placed infrared heaters can be a good choice to keep the chill at bay in human-occupied areas. Infrared is another term for radiant heat. For example, a stove, fireplace, oven or even our own sun emit infrared (radiant) heat energy. That energy converts to heat, warming the surrounding air. In a barn, infrared heaters are specially made to produce safe, comfortable radiant heat. When asked by a client, we specify that heaters are directed downward from the ceiling toward a target area below. In an equestrian facility, infrared heaters can be directed toward wash stalls and/or and grooming areas, or down a common walkway, between horse stalls or even in riding arenas. 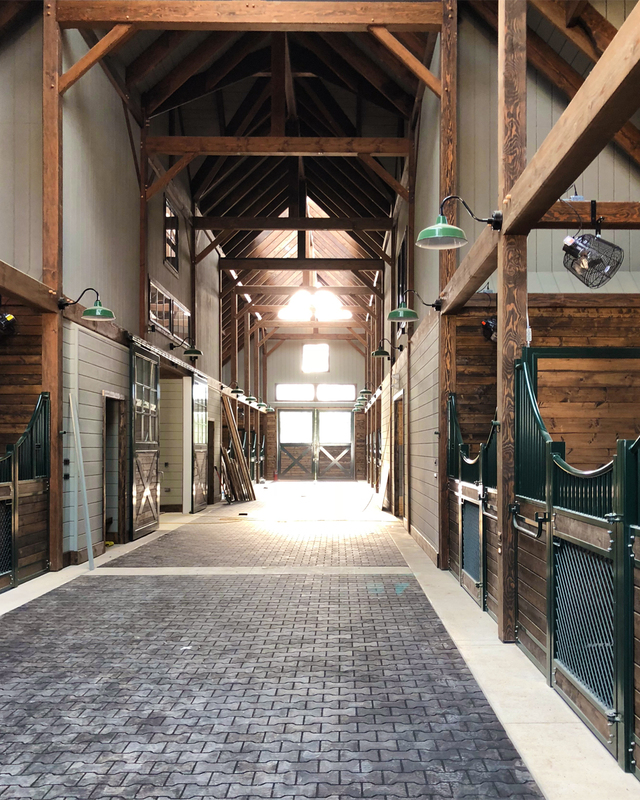 Blackburn Architects uses two scientific principles to ventilate horse barns – the Bernoulli Principle and the Chimney Effect – vertically removing harmful bacteria and ammonia gases that can cause disease and odors. Providing heat for the horse by forced air does little if anything to help the horse except create harmful, unhealthy conditions. When requested by a client, we can specify heated floors. Infrared tube heaters emit soft, comfortable radiant heat energy without creating drafts. Infrared heats the ground. Warm floors = warm bodies & feet. As we all know, horses can naturally withstand colder temperatures better than hot temperatures. If permitted to keep their winter coat and remain dry, horses can withstand even very low temperatures. For colder temperatures, we recommend keeping cold drafts off the horses by closing Dutch doors at stalls (add weather stripping to the doors if needed) and closed aisle doors. In other words, if a horse can stay dry and get out of a steady breeze or draft they have a much better chance to maintain their own health.